RM: You say Yoonan is using a wry tone when he writes about tyranny. Is the ‘friend’ a petty thief, or perhaps a corrupt politician? Can we tell from his tone? SS: That we can’t really tell. Yoonan’s voice is tinged with ambiguity throughout the poem. He could be addressing anyone, but if you want my personal opinion, I would say he is mainly addressing corrupt politicians and tycoons; basically, anyone who hoards other people’s share of life. I feel this poem is very befitting to the world’s status quo, especially with Donald Trump out there preaching about everything he himself doesn’t practice when it comes to the petit bourgeois. I love the line in Yoonan’s poem, “don’t live at all costs”, because it speaks volumes. RM: In the fourth poem, where the ‘friend’ appears, is there any symbolic significance of the hive stolen from someone’s dream? It’s a memorable image. This pier has been here—standing strong—for fifty years. May it remain as strong forever! nor does it ever budge. the way this pier treats the water. RM: I love the line in the third poem, ‘We break into tears, just so we have broken something’. ‘Break into tears’ is of course an English language idiom, a fairly common one. How did you translate this line? What is the original Persian phrase? SS: That’s an excellent question. One of the biggest challenges translating Persian poetry entails is the usage of homonyms and homographs. In this case, we have the verb shekastan, ‘to break’. However, in the original poem Yoonan uses this word with two different meanings and in two different contexts. First, he uses it for boghz which, as a noun, means ‘gulp’ in Persian, as in when one gets choked up and is about to cry or sob. In the original poem, Yoonan says, verbatim, ‘We break our gulp,’ because ‘break’ is the verb that collocates with boghz in colloquial Persian. Then, he uses the word ‘break’ for the act of breaking an object. The reason why I used the phrase ‘[We] break into tears’ was because I wanted to maintain the usage of the word ‘break’ in both sentences. RM: Amazing that the idioms are so closely related between languages! How did you approach other idioms, like ‘tough luck’ from the third poem, or ‘I feel blue’ in the last poem? SS: ‘Tough luck’ was a different story. If you translate it verbatim, it would be ‘spit on this luck’. A more liberal translation in English would be ‘we curse our luck.’ Since I wanted to translate it to a simple interjection that shows rage and frustration, I opted for ‘tough luck’. The second example is an interesting case. In everyday Persian we use the phrase delam gerefte, which literally means ‘my heart has squeezed’ or ‘my heart has crumpled’. In order to make the text accessible to an English-speaking reader, I had to translate the phrase as ‘I feel blue’. At times I receive some criticism from my fellow Iranians regarding such translations. They might tell me, for example, that ‘I feel blue’ is not as rich or as poignant as delam gerefte. And every time I have to remind them that I’m translating the text to a different language. I always tell them that translating something to another language is like traveling to a different region of the world. You need to be somewhat or fully familiar with the etiquette, customs, traditions, and conventions that are acceptable to the people of that region, otherwise you will come off as either gauche, inelegant, inappropriate, or simply nonsensical. RM: Have you met Yoonan? How often do you ask him questions regarding your translations? We were doomed to have a nightmare. I was immediately hooked, and asked Amir about who Yoonan was. Then, my mother, who has previously published a book of poetry in Azerbaijani herself, met with Yoonan last year and told him about my translational endeavors. That was when Yoonan wrote a note, authorizing me to translate and publish his work. Eventually, I met with him at a coffee shop in Tehran this past summer with my friend Amir keeping me company. We talked at length about poetry and other subjects. I explained to Yoonan some of the difficulties I had faced when translating his work. Also, I have had the privilege of consulting Robert Hass and Matthew Zapruder a couple of times on my translations. Their feedback was enormously helpful. On a different note, during our hour-and-half talk with Yoonan, we smoked about thirty or forty cigarettes between us. Both Amir and I had quit smoking back in 2010, but we felt the strong urge to keep up with Yoonan. RM: No wonder there are so many cigarettes in his poems! You have published several translations here and elsewhere; are there plans to put together a book of poems? SS: First, I must admit I never imagined Yoonan’s work and my translations would be met with such rave reviews from journals and readers alike, but since January this year, I have had about thirty or so of my translations published in various journals in the United States and elsewhere. Initially, I used to submit mostly Yoonan’s romantic poems, and all journals would turn me down, saying the poems were not the right fit for them. Those rejections gave me a better idea as to what the global literary landscape was like. I then decided to submit contemplative poems instead. That was when everything changed and the acceptance emails kept pouring in. I have recently put together about a hundred of my translations from Yoonan’s six books of poetry, and I hope to find a publisher who would be interested in publishing a selection of my translations. I have reached out to Mage Publishers and look forward to hearing from them. They chiefly publish works of Persian literature, so we’ll see. RM: Could you tell us what it means to be Yoonan’s ‘authorized’ translator? SS: Well, I’m very delighted about working with him because we share a lot of the same views on both poetic and personal levels despite our age gap. After all, he is almost twenty years my senior. I honestly think that the most important thing is to have Yoonan’s unique and powerful voice heard, and hopefully, appreciated. So, I’m glad to serve as what I would call a ‘peacemaker’, bridging the gap between two different languages and universes. I lately finished translating his collection of flash fiction, See You in Hell, which I think is a great book and bespeaks Yoonan’s amazing versatility as a writer. RM: The United States’ relationship with Iran, as we know, is quite feeble. Every headline, every word out of American pundits’ mouths about Iran sounds like fear-mongering. Meanwhile, Iranian or other Middle Eastern poetry and fiction are rare in the American publishing market. What is your take on this? What are your hopes for translating Yoonan and others into English in this political climate? SS: Yeah, I’m pretty familiar with the ways in which the American media depicts Iran. This doesn’t surprise me, though, because the media everywhere prefers spewing hatred to spreading love. I think that, before anything, as human beings, we need to truly acknowledge that we all are different hues of the same spectrum—that is the human spectrum. This is unthinkable for most people, because they can’t resist the propensity to cling onto a sense of superiority over others through something, be it religion, nationality, or race; sadly, more often than not, our hubris overpowers our humanity. I hope that translating and publishing works of Persian literature can somehow minimize the media’s sclerosis towards illustrating a fairer, more charitable portrayal of Iran as a nation. Donald Trump has just been elected President of the United States. He openly expressed explosive racism, xenophobia, misogyny, intimidation, religious persecution, and discrimination throughout his campaign. What is your take on all of this? What do we do as a nation to move forward? How can art, poetry, and translation help us? Like many other people, I was in shock to learn about Donald Trump becoming the president elect. It also baffles me when people say we should respect Mr. Trump because he is the new president. Well, last I checked, respect is not inherited but acquired. Donald Trump has been using incendiary, spiteful comments for months, and his position as a president shouldn’t confer special privileges; in fact, it should be all the more reason for the American people to put him under scrutiny. He reminds me of a Persian saying: Thousands of friends are far too few, one enemy is too much. I guess in Donald Trump’s world, though, thousands of enemies are far too few, one friend is too much. I wish I could say that art, per se, has been able to put an end to belligerence in the history of the world, but I can’t recall any examples. As things stand, I don’t know if even good comedians can alleviate the severity of the situation and help people deal with the cataclysm that’s going on. You see a lot of photos and videos on Facebook and Twitter containing prejudice and hate crimes against ethnic and religious minorities because the president-elect himself kept legitimizing such hostility and hate throughout his campaign. I’m not an American citizen, as I was reminded by a narrow-minded man the other day, but this is not an American problem; it’s a human crisis. Despite everything that’s happened, let’s try to stay positive; at least, the election made us realize that most people in the United States are fiercely opposed to Donald Trump’s hate-driven ideology. The power of literature lies in the fact that it can ferry us to a parallel universe where we have an opportunity to reconsider our presumptions and reinvent ourselves. A friend of mine from Iran once told me that her English literature professor had told them, during the opening session of their class, that “we read works of literature to become better human beings”. Also, translation, in my humble opinion, is not about perfection because it’s an imperfect act to begin with: you are trying to reconstruct something within a different language, which doesn’t give you the same array of possibilities as its original counterpart. I think translation is an attempt at deciphering and delivering thoughts, ideas, and words as comprehensively and comprehensibly as possible. can put an end to suffering. That is why I’m always singing love songs. refuses to forget his beloved in the thick of a war. Siavash Saadlou’s translations of Rasool Yoonan’s poems appear in the Fall 2016 issue of Asymptote. Ryan Mihaly is an Anne Waldman/Anselm Hollo fellow at Naropa University, where he is pursuing an MFA in creative writing and poetics. 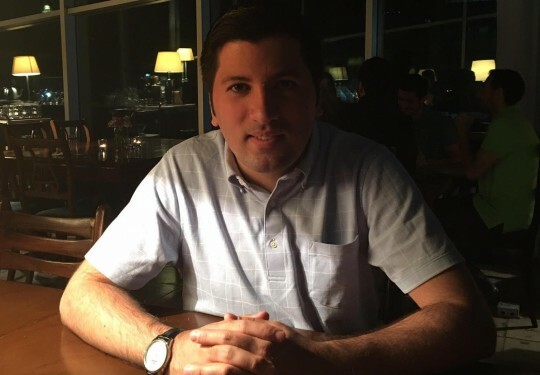 Other interviews with translators can be found in The Massachusetts Review blog, Observator Cultural (Romania), Biblioklept, and Asymptote, where he is Interview Features Editor.